The 28.9 metre motor yacht Kokomolink, listed for sale by Pete Woods at Woods & Associates, has been sold in an in-house deal with Matt Woods introducing the buyer. Built in GRP by Italian yard Dominator, she was delivered in 2009 and accommodation is for eight guests in four cabins consisting of a master suite, VIP suite, a double to port and a twin to starboard. The expansive teak aft deck boasts over 280 square feet of space. Offering true flexibility, this area features moveable modular synthetic wicker furniture used to create a relaxed and casual relaxation area. This space also features a drop-down concealed TV in the overhead, and a cocktail bar with a Terra Rossa marble sink and counter, ice maker and a fridge. Last but certainly not least is the huge teak-decked flybridge with space not found on many 100-120' yachts. Aft is an open and wide seating area with moveable synthetic wicker furniture. Moving forward and to port is a long L-shaped food preparation bar. This beautifully designed piece features a soapstone counter and professional gas grill as well as fridge drawers, sink and generous storage. Opposite and to starboard is a long serpentine seating/lounging area running the length of the bar. Forward again is a large L-shaped dining settee and an eight foot dining table able to seat up to 10 guests. 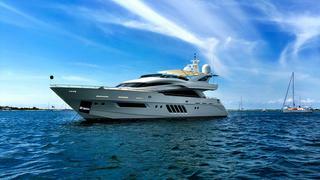 Twin 2,435hp MTU engines power her to a cruising speed of 20 knots and she is fitted with zero speed stabilizers. Lying in Palm Beach, Florida, Kokomolink was asking $3,950,000.